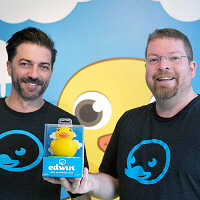 Edwin is an interactive rubber duck toy with a lot more to offer than just bobbing around the bath. He’s fully connected, so his movements sync up with his digital counterpart in various free apps. 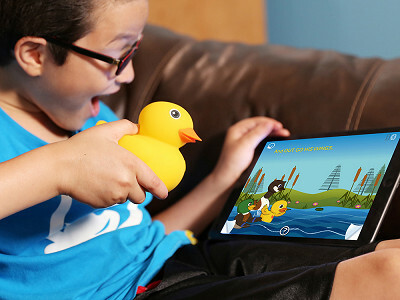 One of the first toys to use two-way interactivity, Edwin moves on screen based on how kids move the physical duck. Tap his wing and he’ll wave onscreen, or tap his tail feather to get him to quack. His signature app leads kids through charming stories, or sings along with them in a silly bath song, or guides them through color matching games. Makers Don Inmon and Matt McBeth were creating a wireless, waterproof speaker, when along the way their idea morphed into a smart rubber duck for children. Edwin is fun for kids, but he’s also useful for their parents, too. He functions as a forehead thermometer, and grown-ups can track readings on his Wellness app. When it’s time for bed, his soft body becomes a cozy nightlight or a soothing sound machine through his Sleepy Time app. Edwin has fun playing in the tub, snuggling at home, and tagging along in the car, too. When he needs a break, rest him on his nest to recharge his batteries. This sweet, playful duck is sure to become your kid’s favorite feathered friend. Hello Grommet! My name is Edwin, and I am the world’s first Smart Duck. My inventors, Matt MacBeth and Don Inmon, created me as a fun and entertaining friend for your child. I love to interact and learn through my stories, songs, and games, while being a soothing nightlight and waterproof speaker too! We are so excited to be featured on The Grommet, and I look forward to hearing from you. We are happy to answer any questions you have. Thank you! Edwin, more toys like you are infusing technology and education, what do you see as the importance of that? @Mike Hi Mike! It came to no surprise that in 2015 the Toy Industry Association predicted trends which included educational, academically-focused toys offering “smart play” opportunities, continued integration of technology in the youth electronics sector. Kids today are surrounded by technology, specifically mobile, and while it's important to embrace the trend, I also felt it was important to add another dimension to not only make education fun, but to also allow for interactions beyond a flat screen. My inventors created SQUACK technology to answer this call, allowing for 2-way communication and motion-based play. This platform offers limitless possibilities in interactive education, keeping children engaged with lessons through technology - the immediate benefit of which is all they realize is how much fun they are having! I have a 6-year-old daughter. What age children do you like to play with best? @Erica Hi Erica! 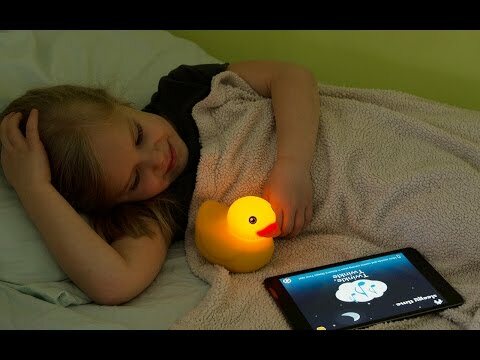 Currently my app content is geared toward ages 0-5, although my waterproof Bluetooth speaker (with the ability to stream any music) and night light has proved to be entertaining and useful for children of all ages! You can download my app for free to try out the stories, songs, and games - keeping in mind there will be lots more content to come very soon! I see you using a tablet to interact with Edwin. Will he also interact with a smartphone and/or a PC? @Mindy Hi Mindy! Edwin's app is compatible with mobile devices, including smartphones, but not PCs. Android: Edwin’s main app is available in Google Play. Interactions require Android Marshmallow enabled devices, although we are very close to releasing a new Android app with a much broader range of compatibility (details available soon!). The current app may be installed on v4.3 enabled devices with limited interactions. Bluetooth audio streaming is compatible with all BT 4.0 enabled devices. @Edwin I have an Android phone and want to use Edwin in the pool to tell me the temperature and act as a night light. Are these features available in the limited interactions? @linda Hi Linda! My water temperature sensing app for Android will be released later this year. I love swimming in the pool while streaming music, too! @Amanda Aw! Unfortunately, the iOS version on iPad 2 doesn't include the necessary support for our advanced two-way communication platform. The app will install and can be played with manually, but I won't be able to control the action on the screen. @Edwin I'll have to put the ducky on my Christmas wish list. Hopefully you'll let people know when the Android App is ready. Will I be able to turn on the light as well as sensing the temperature? Does this act as a bluetooth speaker as well? Hi Linda, we will certainly let you know when the Android app is available. You should have complete functionality when the app is released. I had the same question about the recommended age group. Also, does Edwin come with a warranty or guarantee? Thanks! @Francine Hi Francine! As answered above, currently my app content is geared toward ages 0-5, although my waterproof Bluetooth speaker (with the ability to stream any music) and night light has proved to be entertaining and useful for children of all ages! I do come with a one year warranty. I think this is a fantastic invention and will be the first of many to come, I have a feeling. Question??? I assume the app is free but are the songs, games, stories etc all on a fee structure? @Lauri Hi Lauri! Thank you very much! Yes, the apps are currently free, and we will be releasing additional free stories, songs and games in the weeks to come in the form of app-updates (be sure to check for updates in the app store!). As we grow in the future, our content will consist of a combination of free and in-app purchase options. Be sure to sign up for our newsletter and follow our social media to keep up with special offers! Will this work on a Kindle Fire HD tablet? @Pat Hi Pat! Unfortunately, I do not have an app for the Kindle Fire at this time. I am allergic to Latex, is it really made out of rubber products? Hi Eva, it is not. Edwin is made of BPA-free silicone. Edwin is an interactive rubber duck toy with a lot more to offer than just bobbing around the bath. He’s fully connected, so his movements sync up with his digital counterpart in various free apps. 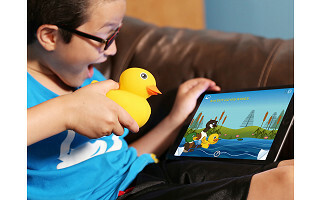 One of the first toys to use two-way interactivity, Edwin moves on screen based on how kids move the physical duck. Tap his wing and he’ll wave onscreen, or tap his tail feather to get him to quack. His signature app leads kids through charming stories, or sings along with them in a silly bath song, or guides them through color matching games. Makers Don Inmon and Matt McBeth were creating a wireless, waterproof speaker, when along the way their idea morphed into a smart rubber duck for children. Edwin is fun for kids, but he’s also useful for their parents, too. He functions as a forehead thermometer, and grown-ups can track readings on his Wellness app. When it’s time for bed, his soft body becomes a cozy nightlight or a soothing sound machine through his Sleepy Time app.